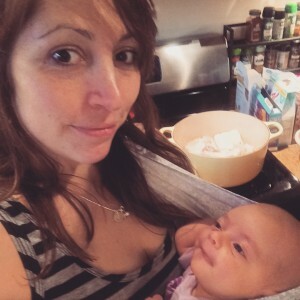 I haven’t done much cooking over the last six weeks, since, you know, baby, etc. But our last round of parental visitors left yesterday and I figured it was a good time to restart my normal cooking routine. 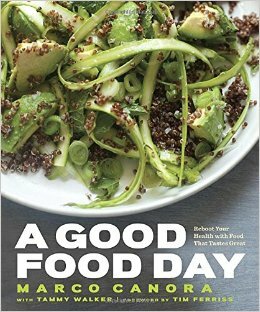 I’d been wanting to crack open Marco Canora’s cookbook, A Good Food Day: Reboot Your Health with Food That Tastes Great since I’d gotten it. I liked the fact that the recipes seemed healthy but not diet-y, with lots of fresh, whole ingredients and flavors. Canora’s philosophy, as laid out in his “10 principles for a good food day,” involves making eating enjoyable through consciously, mindfully eating a wide variety of real, high quality foods. This jibes with my philosophy, too, so I was excited to give the book a shot. 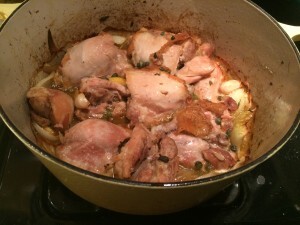 I chose the recipe for braised chicken thighs with garlic, lemon, and Greek olives, since I’m a sucker for a good bone-in, skin-on chicken thigh. I started cooking just as Al was dropping his dad and brother off at the airport, and Lucia was awake (sort of), so I threw her in the sling, covered her with a receiving blanket so that no hot oil would come anywhere near her, and got cooking. I realized as I was cooking that I didn’t have the Greek olives that the recipe called for, so I substituted some capers, figuring they’d provide the salty, briny kick that the recipe needed. I also didn’t bother peeling the garlic cloves as the recipe instructed — who has the time, right? The recipe was easy to make and came together quickly — definitely do-able for a weeknight. And, I’m happy to report, it tasted great. I am not always a fan of cooked lemons — I think sometimes the tartness can verge on the sour and overpowering — but in this, the lemon-y taste was counterbalanced by the sautéed onions and garlic (yum). The chicken came out perfectly tender and juicy. 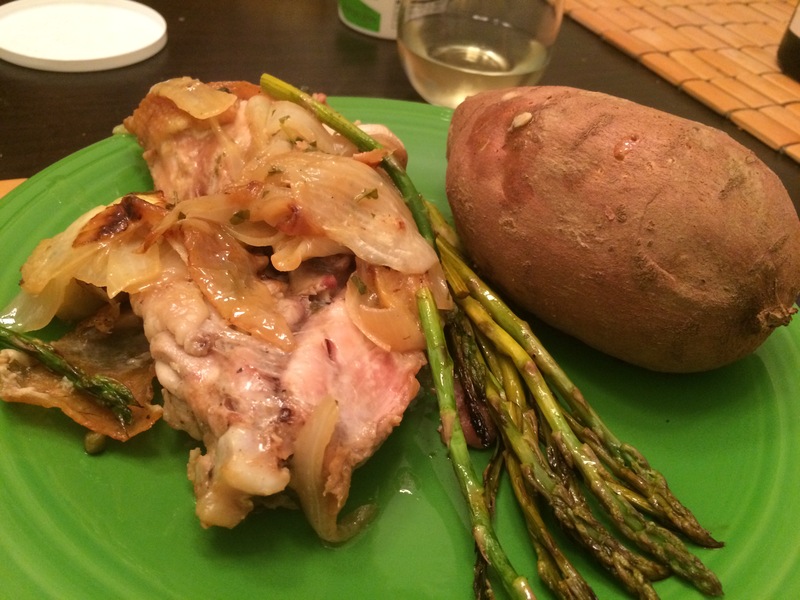 I served the dish with baked sweet potatoes and roasted asparagus. Overall, a very satisfying meal! I’m looking forward to cooking more out of Canora’s book soon. Al has requested the cacio e pepe popcorn, so that’ll be my next project. Recommended for those who want to cook with healthy, whole ingredients without skimping on satisfying flavor. This entry was posted in Books, Food and drink and tagged A Good Food Day, Alastair, books, food, Mario Canora on March 15, 2015 by Stephanie.